Virginia Wesleyan University has introduced the LiveSafe mobile app to the VWU community. A powerful safety tool, this free, voluntary app is extremely user-friendly and available on all Android and iOS devices. A valid Virginia Wesleyan email address is all that is required to use the app on or near campus. Users can easily send information about crimes or ongoing incidents and can even include photo or video evidence of occurrences. This information is received directly by VWU's Campus Security department. 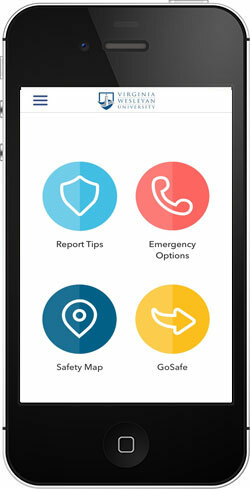 The app includes emergency contact, crime map and "Safe Walk" location features. LiveSafe also serves as VWU's Emergency Notification System and replaces the former e2Campus system. In the event of an emergency scenario on campus, anyone signed up for the app would receive a text, email and/or push notification on their mobile device. Students, faculty and staff are strongly encouraged to download and use the app.